It was our anniversary and Matthew was so excited to give me his gift this year. I had known beforehand that he wanted to get my grandmother’s ring reset, so I was pretty excited as well. Unable to conceal his excitement, he handed me a ring box and I tore into it. I was shocked when I finally saw the ring. The diamonds were so much larger than I remembered and they were sitting on top of an orange plastic band. Upon inspection of the ring, I noticed that the diamonds had been hot glued to the band. “I love it!” I told him, the smile never fading from his face. And then a diamond popped off. I had known beforehand that Matthew was going to have my grandmother’s ring reset and that he wanted to give it to me for our anniversary last week. The day before, he walked in the door and I knew he had picked it up. Then he said, “I just hope you like it.” And bam, I am immediately hit with fears that I am trying to rationalize in my head. I kept saying to myself, it can’t be bad, it’s just diamonds…that’s it. The ring is all diamonds. It will be beautiful. And then I went to sleep that night and had the above mentioned dream. It kept me up all night as I tried to reassure myself, there’s no way he can mess this up. I was terrified. He kept me waiting ALL day. I called m mom and told her about the dream. I told my sister about the dream. That evening I received several texts from Sara asking for a picture of the ring. Finally at dinner he said he couldn’t handle it any longer and he handed me a little black box. I was shocked. It was beautiful, exactly as I hoped it would be and NOTHING like the dream. The diamonds were, in fact, the same size that I remembered them being and they were NOT glued to the band. Putting on that ring, I felt newly engaged, except this time, I don’t have to plan a wedding. A slam dunk on all accounts, I think. 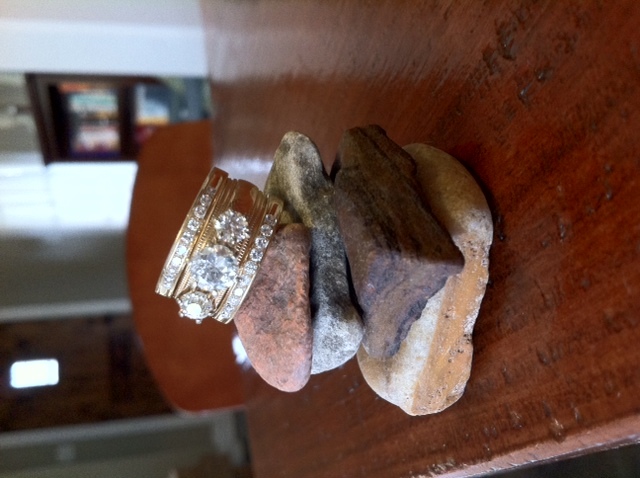 And every time I look at it, I get to think about my Mimi…and how she wanted all of her girls to have diamonds. I miss you, Mimi, but am so glad I get a reminder of you everyday. Not that I need the ring to remember you, just that it’s nice to have something tangible. So…I suppose you want to see it? 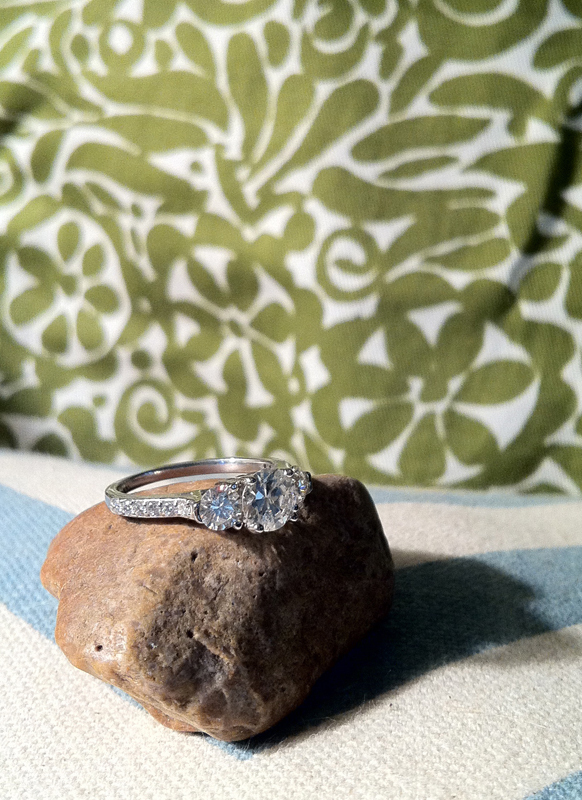 Here is the original, beautiful ring she had made. I also want to note that she had this ring made out of four different rings, so Mimi was not a stranger to resetting her diamonds. And here is the ring after Matthew reset the diamonds. Happy Valentine’s Day! I’ll admit, I am not a huge celebrator of this holiday. I don’t know that Matthew and I ever exchanged gifts for it except for the first one we were dating…and his mom bought me a T-shirt. Does that count? Maybe it’s all of the Mad Men watching that we’ve been doing recently that made me decide to stick on my pearls, or maybe I’ve finally circled back. Either way, I am loving wearing studs again. And today, I’ve rounded up some of my favorites – because gifts aren’t just for Valentine’s and anniversaries, right? I’ll take a love gift any day. 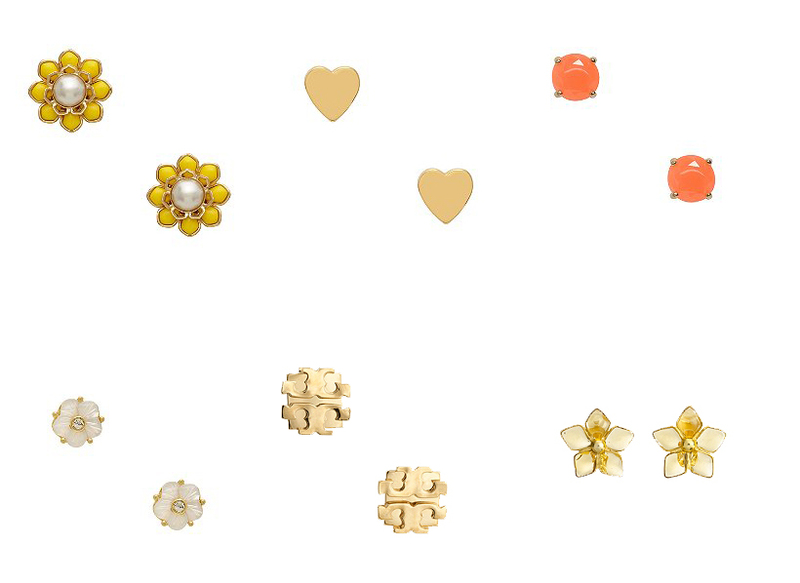 Earrings above, via Kate Spade and Tory Burch. Be sure to check back later this week for my gift to Matthew for our anniversary. I am SO excited about it. And Matthew, if you are reading this, there is a hint somewhere in this post about your gift.